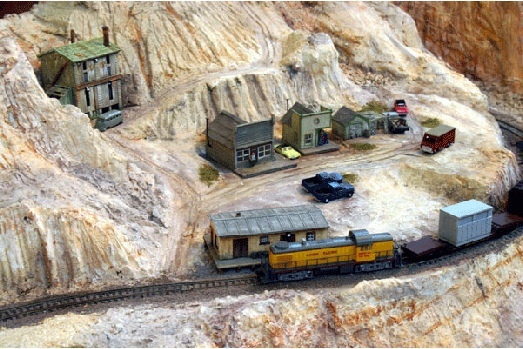 Sandwell County is a layout that was built in a hurry. 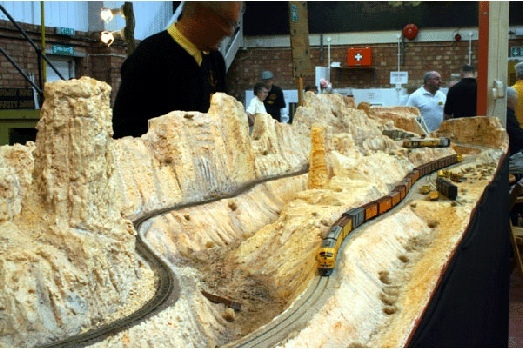 When the N Gauge Group were asked to provide a replacement for a layout that had dropped out of the NEC, the only available layout was Temple Dean, which had been in the exhibition the previous year. 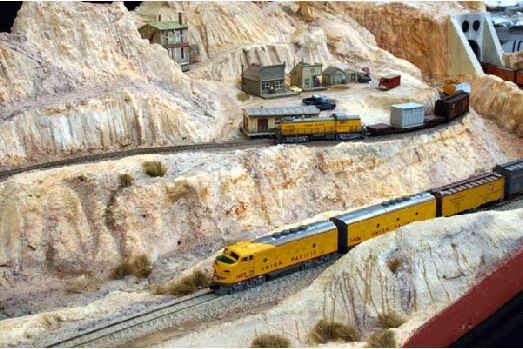 A jokey comment "we could always build a new layout" was followed by "well if we set it in a desert there would be no scenery to model", then "if we set it in an American desert I could run my American stock". The joke, became a commitment and Sandwell County was built in 9 weeks. Since then it has been well received at a number of shows. 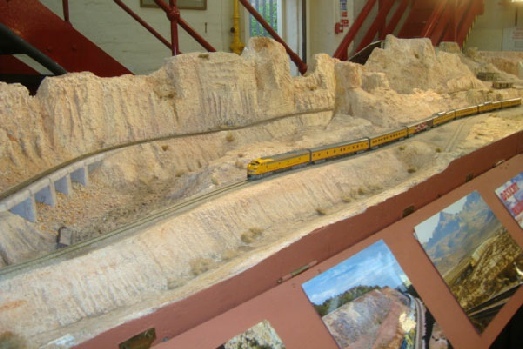 The main feature of the layout is a dry river bed. 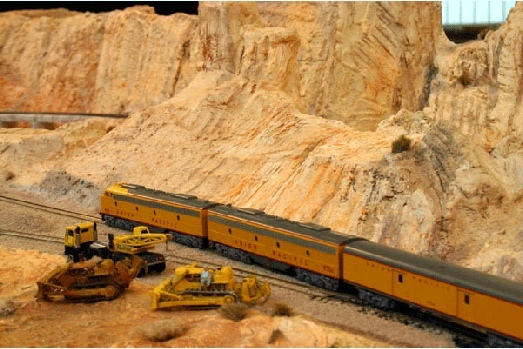 On the far side tall cliffs and mesas crowd in leaving just enough room for the first line, laid in the 1880's, to curve along the bank and past the mining settlement of Sandwell. 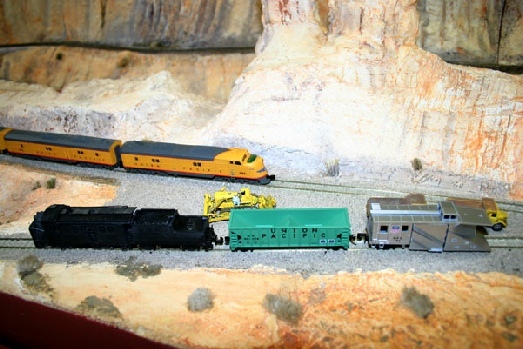 Barely generating enough revenue to pay for the loco coal used, the line hung on until the late 30's. Then came the war traffic. This brought to the Railroads attention, the lines potential as part of a direct route across the continent. 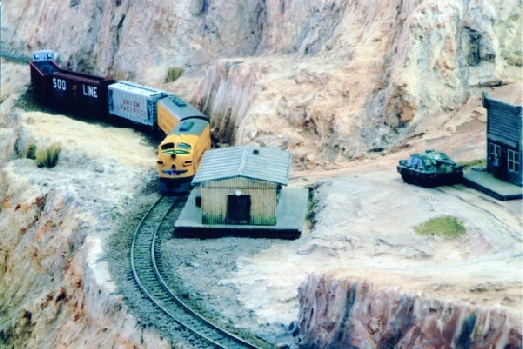 To carry the war traffic, the track was renewed but still followed the original winding alignment. 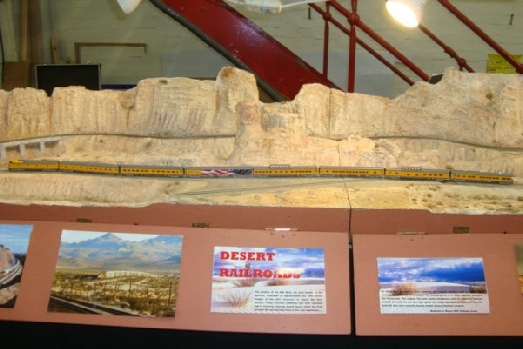 Post war, traffic continued to increase and to cope a new line was put through on the near side of the dry river bed. 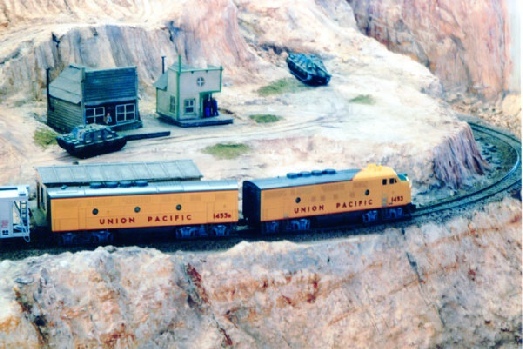 The layout is run with a selection of Union Pacific diesels from the 1960' through to the 1980's. 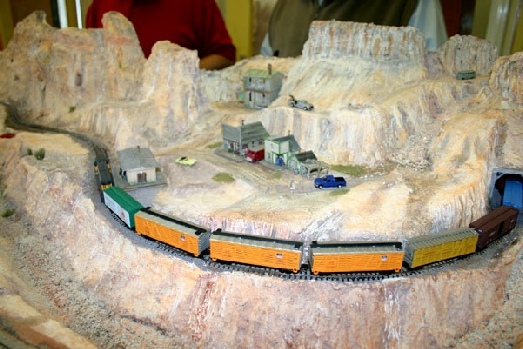 Traffic is long trains of reefers, box cars and tankers, with the occasional train of containers, and once a day a streamliner sweeps through on the new line and provides dramatic views to it's passengers.